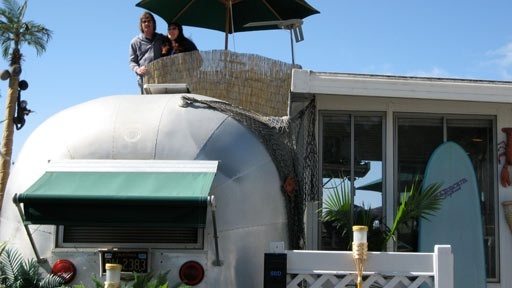 A couple in Southern California with a vintage wooden car restoration business own a classic Airstream trailer that may lay claim to an illustrious past. The trailer’s fading numbers and logo signify it is an early member of the elite Wally Byam Caravan Club International. Members of this adventure club followed legendary leader and Airstream founder Wally Byam all over the world in the mid-twentieth century, from Central America to Europe and from Africa to the Yucatan Peninsula. Did this particular Airstream make the journey on the historic “Cape Town to Cairo Caravan” of 1959? History Detectives explores one man’s wanderlust at the birth of American leisure travel and, ultimately, to a spectacular 221-day, 14,307-mile trek from the tip of Southern Africa to the pyramids of Ancient Egypt. Also in Post War: 1945-1960 Car Tape Deck Is this an example of the first ever commercially produced car tape player? Also with Tukufu Zuberi Preston Brook's Riding Crop Was this riding crop a gift from Jefferson Davis as a reward for attacking a political opponent?